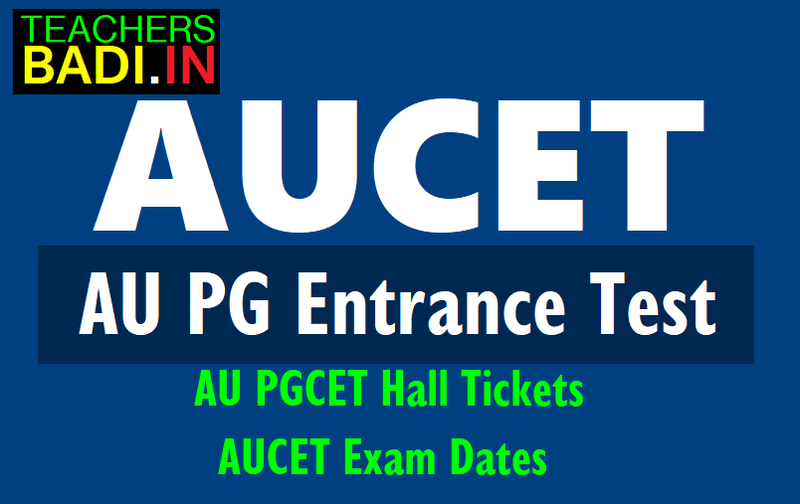 AUCET 2019 hall tickets, Exam dates| AUPGCET 2019: Andhra University has issued Post Graduate Common Entrance Test(PGCET ) 2019 Notification in the month of March, 2019 and AU invites online applications from the candidates who have passed or appearing for the final year examination in the qualifying degree for admission into Post Graduate courses as listed in its website (www.AU.ac.in) leading to Post-Graduate degree in M.Sc., MA., M.S.W., M.Com., M.H.R.M., M.Ed., M.P.Ed., PGDAS., P.O. Diploma in Yoga., 5 Years Integrated Courses in M.B.A. and Nanotechnology for the Academic Year 2019-2020 offered by Andhra University Campus. PG Centre, Vizag and its Affiliated Colleges through AUCET-2019. The Exact Date, Time and Venue of Test Centre will be given in the Hall Ticket. Candidates can download their Hall Tickets and Schedule of Entrance Examination from the website www.audoa.in or http://www.andhrauniversity.edu.in/. The movement the above material is uploaded to the website, it will be informed to the candidates through SMS / E-mail. Hall Ticket and Rank Cards are should be retained by the Candidate even after the Entrance Test as it is required at the time of Counseling. The Andhra University, Visakhapatnam has released the admit cards of Andhra University Common Entrance Test (AUCET)-2019. Candidates who are appearing for the paper can download the same from the official AUCET website. The entrance test is scheduled to be held on May ......., 2019. Candidates can make corrections in their names, reservation category, etc in nominal rolls which will be incorporated in the original data subsequently. They need not contact the DOA office in this regard. Aspirants seeking admissions to various courses in Andhra University and the Dr B R Ambedkar University, Srikakulam will have to appear for AUCET on May.., 2019. The University offers 33 courses in the science stream, 47 courses in the arts, 6 integrated engineering courses and one in law. The Directorate has received 22,948 applications this year. The exams will be conducted at centres in Visakhapatnam, Srikakulam, Vizianagaram, Kakinada, Rajahmundry, Eluru, Vijayawada and Guntur. Around 26,000 candidates will attend AUCET 2019/AUEET 2019, which is scheduled to be conducted on May.. in three sessions per day. Andhra University PGCET Examination would be conducted at eight places in the city, for which all necessary arrangements had been made. As per the AU authorities, 23,086 candidates have applied for various PG courses and 2,686 applied for six-year integrated (B.Tech. + M.Tech) Dual Degree Programmes offered by AU College of Engineering (A) and College of Engineering for Women, Andhra University. Visakhapatnam, Srikakulam, Vizianagaram, Kakinada, Rajamahendravaram, Eluru, Vijayawada and Guntur will be the examination centres. More than 80 per cent of candidates had already downloaded their hall tickets. Differently abled candidates, who need a scribe should inform the chief superintendent of the centre at least a day in advance according to AU Officials. Candidates can make corrections in their names and reservation category in nominal rolls which will be incorporated in the original data subsequently, he added. VC also instructed that candidates should be present an hour before at the examination centre and they will not be allowed once the test commences. Step 1. Go to the official website for AUCET 2019 (audoa.in or andhrauniversity.edu.in/doa). Step 2. On the left side of the screen, click on the tab that says “Download Hall Ticket”. Step 3. Enter your application number and date of birth in the fields provided. Step 5. Download your admit card and take a print out of the same for further reference.